I'm working on building up my audience on facebook as I see it as a convenient way to make product announcements, sales, other promotions, etc. I've placed a link to my facebook fan page at the top right corner of each page on my site. If you haven't already done so, I'd appreciate it if you would take just a moment to click the link, and "like" my page. From time to time I'll make special offers exclusively to my facebook "fans" so I guarantee it will be worth it. On Instagram, come find me @gregstevensdesign. Thanks! Same style as my Wooly Slim(mer) but I've now added a slot on the back side making it easier to access the card you use most. Pretty slick. 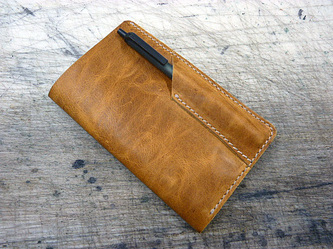 Shown here in my latest leather, Hickory. 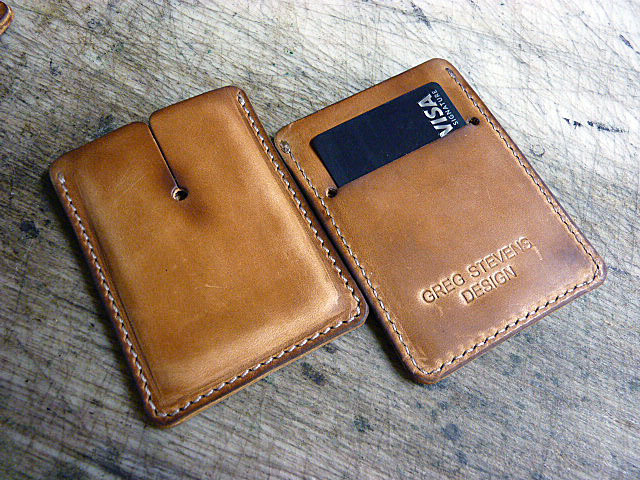 Burnishes up nice, Great little wallet. $65. 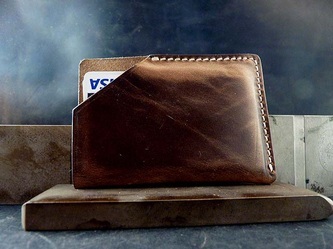 I love a Slim(mer) Wallet and have used one almost exclusively for the past couple of years. I don't carry a lot of cards or other stuff so the single pocket really meets my needs. 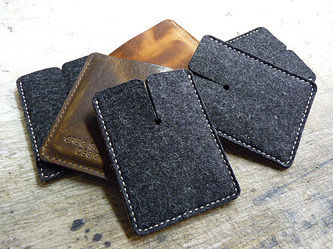 I recently found some 100%, high-grade wool felt and knew immediately that I could put it to use. 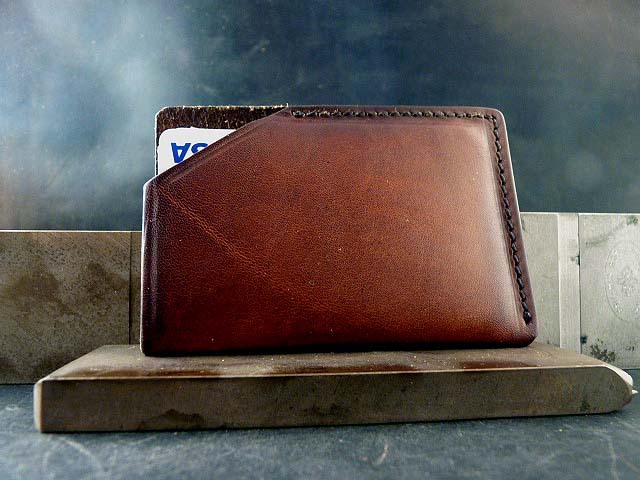 The result is my Wooly Slim(mer) Wallet. Wool front, back side a leather of your choice. Priced from $65, these things are cool. Click HERE for gallery. Sure you can take notes on your smart phone but that's lame. What happens when your battery dies and you can't remember what your wife sent you to pick up from the store? You remember the beer and chips but you completely forget the arugula salad and poppy seed dressing. Not bueno. 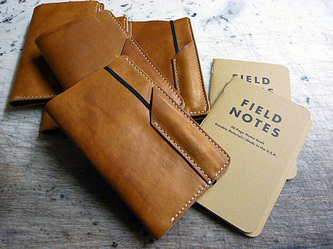 I recently discovered Field Notes and liked their style so much I signed up as a distributor. Nothing quite like simple pen & paper. Sized to fit in your pocket and perfectly designed to re-connect with your pre-technology self. Available from most of my current leathers. 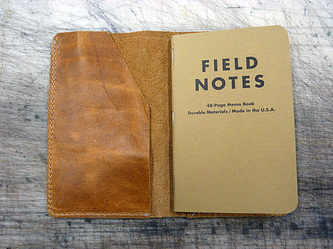 Priced from $100 including a 3 pack of Field Notes notebooks. Click HERE for Gallery. I did a couple of similar jobs years ago and had thought about it a few times since. Then, a couple of months back a client caught me at the right time with a request. 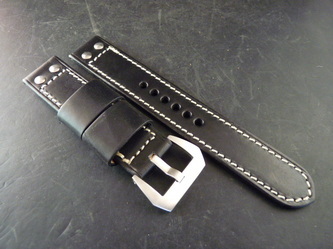 The result is my Cuff Strap. Basically it's one of my straps strapped to a cuff that wraps around the wrist. Two separate pieces so you can wear the strap separately from the cuff if you're not feeling quite so macho. I can build these from most of my current leathers, vintage military excluded since the dimensions don't quite work from the pouches. Surprisingly comfortable. Completely awesome. Priced from $225. Here are a few pics. I end up with a lot of scrap leather and hate throwing it away, especially the vintage stuff. 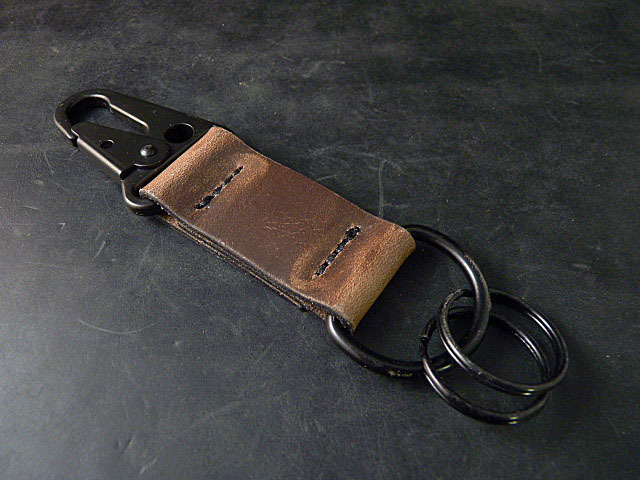 Well, my friend Trent turned me on to a couple of EDC sites, Every Day Carry, and I discover that guys are accessorizing their knives, tools, and outerwear with lanyards, slides, and other stuff. Sounds a bit off? Maybe but these things are pretty slick. 2 for $20, gallery HERE. 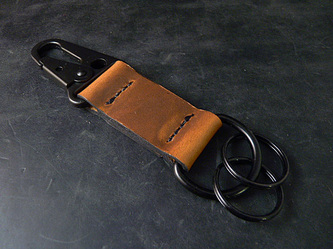 I've always tried to keep a decent selection of straps on hand but for some reason, it took FOREVER to get this section of the website built up. It's done now (mostly) so click HERE to see my list of straps and other items that are built up and ready to go. One of my newer hides, Coffee from Horween's Dublin line is fantastic. Rich, darker brown color with a subtle texture and lighter accents, it's one of the nicest leathers that I have found in quite a while. Which says a lot since all my leathers are great. Click HERE for gallery. This is another one of those hides that I stumbled upon in my wanderings. Love the darker brown color with lighter highlights. Nice texture, makes a great strap. Click HERE for gallery. Just stumbled across this hide and it is fantastic. Has this great vintage feel about it. 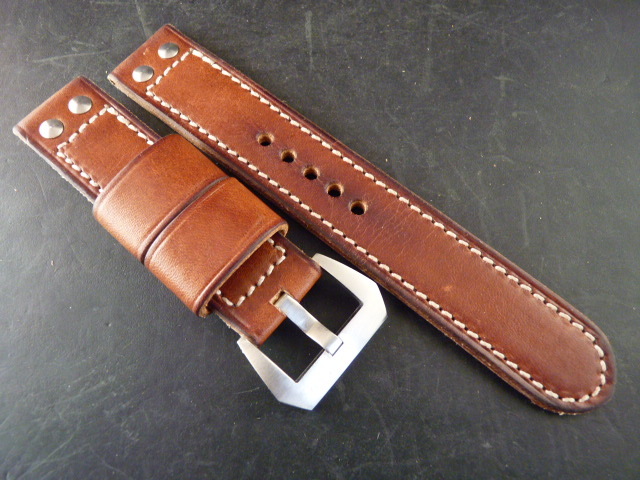 I've got the strap prototypes in production so will post those up soon but in the mean time, here are a couple of belts that I just built up. Stitchless with the Antique Silver buckle and stitched, antique stitch color with the Brushed buckle. I can build these with screw rivets so you can swap buckles around at your pleasure. 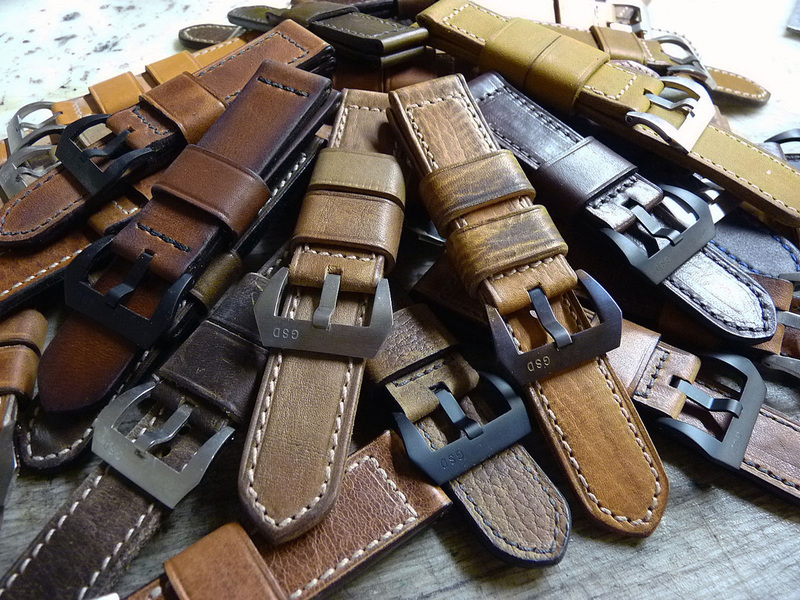 Belts starting at $99, Straps from $200. Yeah, I've been busy. Picked up a lot of new hides lately. Check them out! Coinciding with the release of my GSD-1 pilot watch I also developed a line of pilot straps. Featuring stainless steel screw rivets, these straps are the perfect complement to your GSD-1, IWC, Glashutte, or other pilot watch. PVD screw rivets are also available. Can be built from any of my current leathers. Click HERE for Gallery. 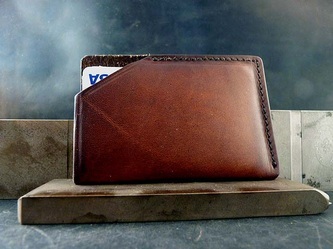 My 2 pocket slim wallet does a great job of simplifying your life. Honestly, how much stuff do you really need to carry around? 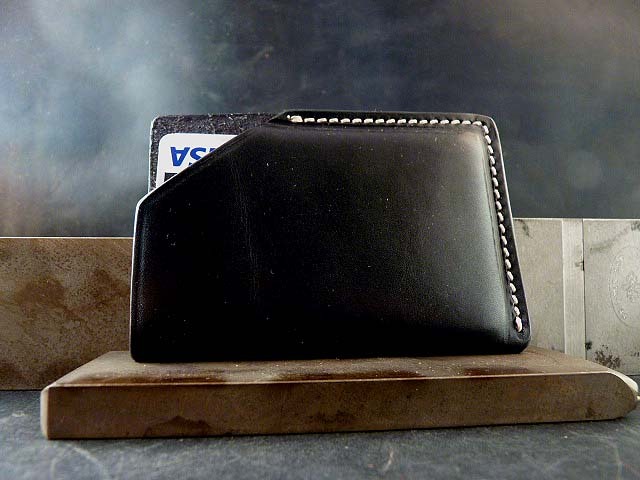 Now, if you're the type of guy who finds 2 pockets to be 1 pocket too many, the Slim(mer) wallet is for you. The Slim(mer) wallet holds pretty much everything that the 2 pocket wallet will hold, a few credit cards and some business cards, but with a single pocket in a nice, slick design. Click HERE for the gallery. Love this leather. Loads of character this leather reminds me a bit of the original Crazy Horse but a bit darker. Check out the golden highlights. Click HERE for gallery. I really ought to come up with a new name for this leather because "Dark Green" while accurate is admittedly a bit dull for such a great leather. Another Horween leather, the Dark Green can look almost black in certain light. Killer on a PVD. Click HERE for the gallery. 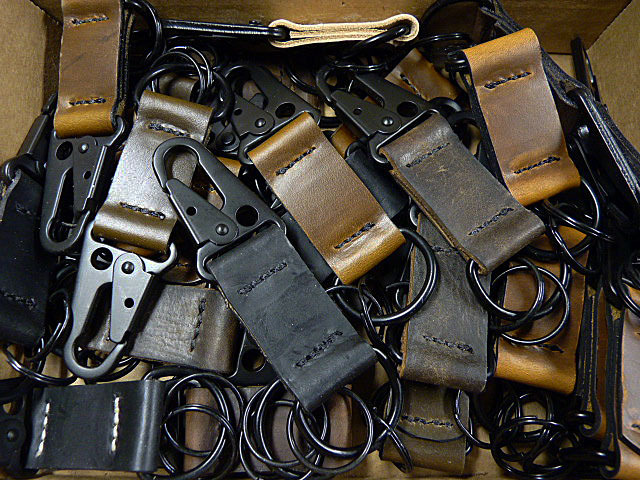 Just got in a new batch of these pouches and was able to get them in the fantastic lighter color. Straps are phenomenal if I say so myself. Click HERE for the MAT49 Gallery. One thing that I've learned over the years is that not all black leathers are created equally. With other colors you can often tell the quality of the leather by the color, texture, etc. Not so with black. In most cases, black is black is black. You can't just look at the leather, you've got to feel it. That's one of the things that I love about my Heritage Series Black leather. Built from world-class English bridle leathers, the feel of this leather is borderline sublime. Slightly stiffer than some of my leathers it breaks in nicely and will give you years of enjoyment. Click HERE for the gallery. Rich reddish/brown leather, develops a nice patina. 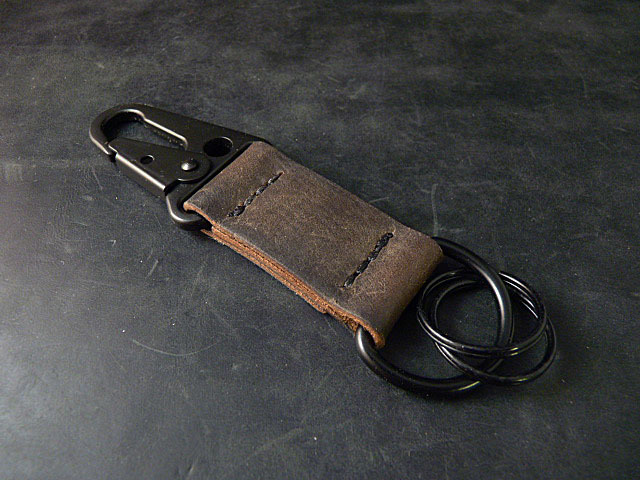 Great for belts and wallets too. Click HERE for the gallery. Crafted from world-class English Bridle leathers you're going to love this leather. First in the series is London Tan. A rich tan/gold leather that will get better and better with age. Hand-burnished edges really complete the classic look of these straps. Click HERE to go to the Heritage Series Gallery. Makes a fantastic belt as well. There is something to be said for a simple design, that is well-executed. I just recently built this belt and love how it turned out. This leather is great to work with. The edges really burnish up nicely--see the keeper in the first picture. That gives you an idea of how the leather will darken up with time and wear. Just about the perfect belt for a pair of jeans. 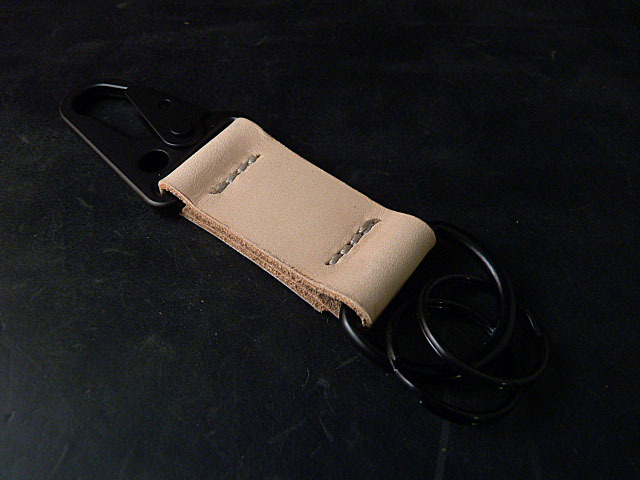 Click HERE for more belt options. This particular style goes back a long way with me. 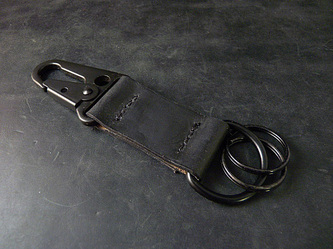 When I first started building straps, all my straps were stitchless. I still love the simple, clean design. It's got everything you need in a watch strap and nothing that you don't--pure functionality. With the Swedish Gustav military leathers, there is so much character and history associated with the leather that sometimes, I just like to leave it stitchless. It's bonded with an industrial grade cement so no worries about it coming apart. Click HERE to go to the Swedish Gustav gallery. Do something nice for your jeans. I just got in some new English Bridle Leather and this stuff is great. 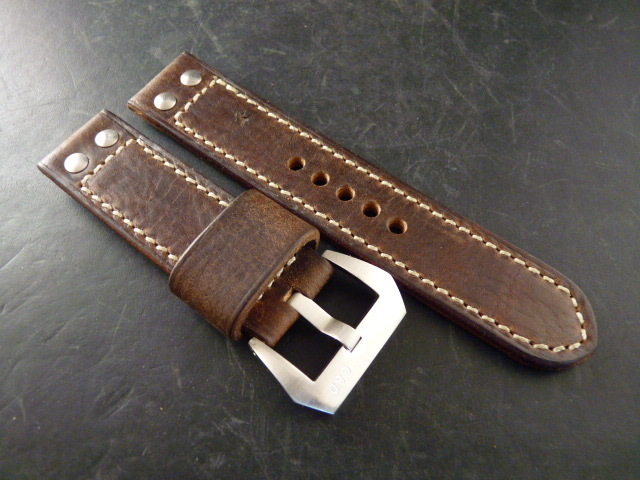 I've got strap prototypes in the works and I just completed these two belts. Simple, stitchless design. I finish the edges by hand. It takes a lot longer but I love the result. Seen here with a brushed Pre-V style buckle or my Antique Copper Roller buckle. Click HERE for my belt gallery. Check out my new Vintage Military Straps built from vintage Swedish and French Military Leathers. 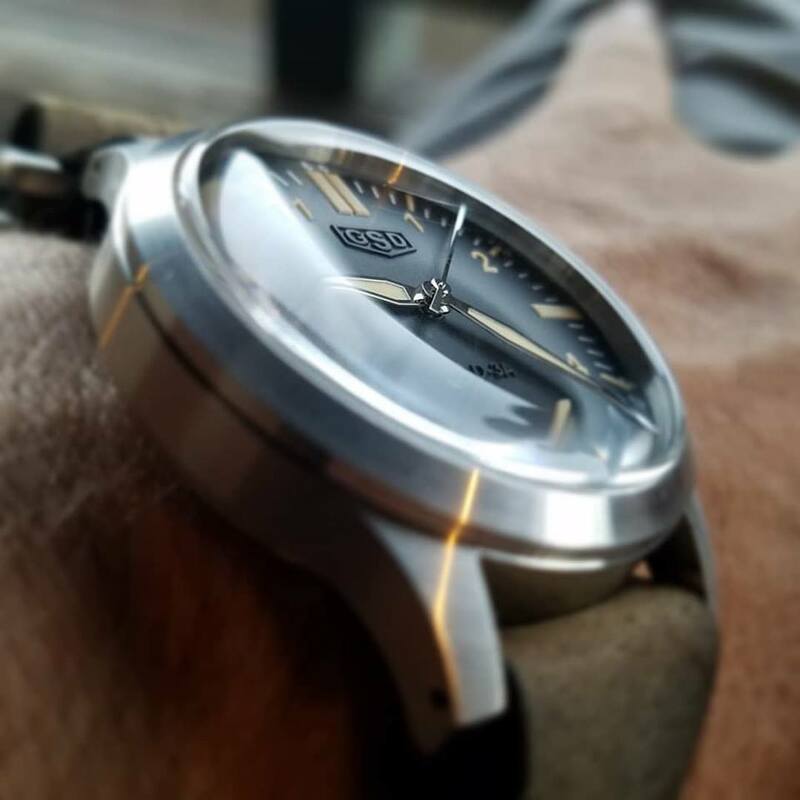 The MAT 49 Historic is killer. This is the coolest strap storage system that you'll ever find. Built from surplus ammunition cans, what better way to store your straps. Case can also accomodate watches as well as knives. I've been a fan of the 5 ring ballistic nylon ZULU for quite a while now. These are the nicest that I've been able to find. I've got lots of colors and sizes available including the hard to find low-lite blackened hardware. Love how these turned out. Available in M, L, XL, and XXL. 1.4mm & 1.6mm Screwdrivers plus my new springbar/pin removal tool. New styles, new pictures. Check them out.